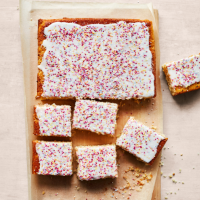 Kids and adults alike will love this fun traybake. You could also turn this into a colourful ‘confetti’ cake by adding 100s & 1000s to the sponge. Mix 4-5 tablespoons into the cake batter just before tipping into the tin. 1. Preheat the oven to 180˚C, gas mark 4; grease a 33cm x 22cm cake tin. Cut a long strip of baking parchment the width of the tin and use to line the base and the shorter ends with plenty of overhang. 2. In a large mixing bowl, use electric beaters to cream together the butter and sugar for 2-3 minutes until light and fluffy. Beat in the vanilla and eggs, then gently add the flour, baking powder and salt until just combined. Stir in the milk until combined; tip into the cake tin. Level the top; bake for 25 minutes until golden and risen. Set aside to cool in the tin. 3. Use the overhang to lift the cooled caked from the tin. For the topping, sift the icing sugar into a mixing bowl and make a well in the centre. Add the vanilla and 2 tbsp milk into the well, gradually drawing the sugar into the liquid until you have a smooth icing. Check the consistency, adding more milk a drop at a time until you can drizzle it over the cake and spread out evenly with the back of a spoon. Sprinkle with the 100s & 1000s, allow to set for at least 5 minutes, then slice into squares when ready to serve. This recipe appeared within the April 2019 recipe card collection.